New article: Climatic and volcanic forcing of tropical belt northern boundary over the past 800 years. There are many reconstructions of past climate based on tree-ring data. Some reconstruct the climate within a particular watershed or limited geographical region, and in recent years much broader-scale reconstructions have appeared, for example mapping reconstructed drought over entire continents. The Trouet Lab group based at the LTRR has been reconstructing the mechanisms of climate at an even broader level: features of atmospheric circulation at a planetary scale. One previous study examined the past behavior of the jet stream in the northern hemisphere, and a study has just appeared based on another planetary atmospheric feature: the northern boundary of the tropical belt. Raquel Alfaro-Sánchez and her co-authors chose this feature in part because of its significance for human societies as well as for the its importance for global atmospheric circulation patterns. 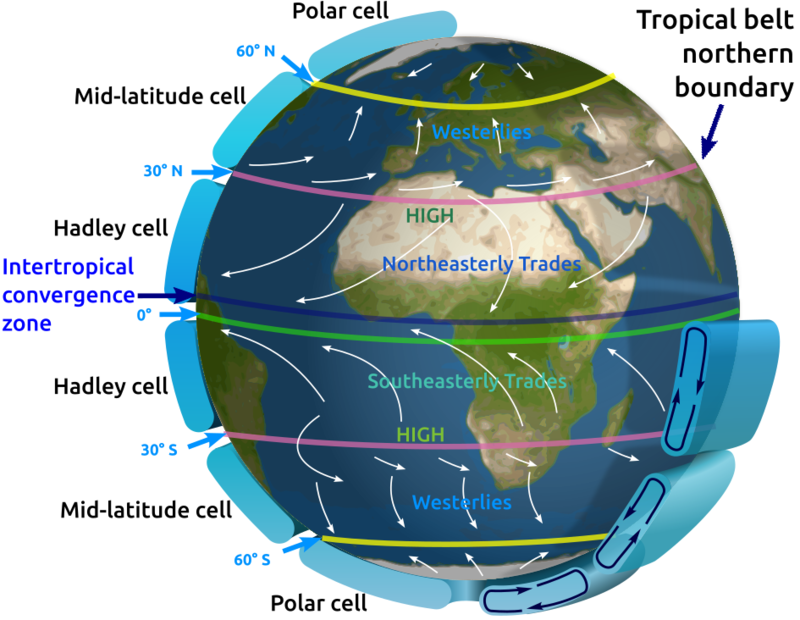 In a band around the Earth, near the equator, moist air rises from the surface high into the atmosphere, drying out in the process, circulates aloft to the north and south, then descends within two bands that also encircle the planet: many of the major deserts are within these two bands of sinking dry air. This feature is called the Hadley circulation, and the boundaries of the tropical belt to the north and south give its extent. If the boundaries expand, deserts advance to the north and south, if they contract, the deserts shift closer to the equator. The reconstruction used data from many samples taken from drought-sensitive trees that had already been summarized to represent five broad geographical regions: western and central North America, Turkey, northern Pakistan, and the Tibetan Plateau, inferring from them the northern extent of the Hadley circulation during the early Spring. From the year 1930 onwards there were enough actual meteorological observations to give the position of the boundary and ground the reconstruction in reality: the tree-ring data could extend it back to the year 1532, and back to 1203 with three out of the five regional summaries. The reconstruction accorded with observations and reconstructions of some other large-scale meteorological patterns, El Niño Southern Oscillation (ENSO) and Pacific North America (PNA): the boundary contracted towards the equator when these patterns were positive, and expanded to the north when they were negative. There are hints that human activities (emissions of greenhouse gasses and aerosols) have strengthened the connections with these patterns in recent years. Large volcanic eruptions that blasted sulfur compounds into the stratosphere matched contractions in the boundary, and there have even been geoengineering proposals to replicate these artificially. Looking at timescales of around ten years, the biggest reconstructed expansion of the boundary was from 1568 to 1634, which might coincide with historical records of crises in human societies vulnerable to arid conditions shifting north: in the first English settlements in North America, the drastic contraction of Jamestown Colony and failure of the Lost Colony of Roanoke Island; in Turkey, a drought in the 1590s setting the stage for the Celâlî Rebellion; in eastern China, a 1586–1589 drought that ushered in the final decline of the Ming dynasty in the following century.